Welcome to CSPDigital's Beverages edition, a special-edition online magazine focusing on the Beverage category. 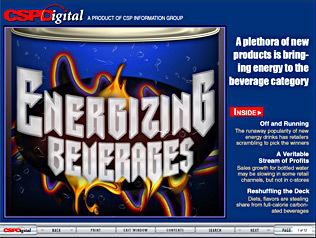 Off and Running: The runaway popularity of new energy drinks has retailers scrambling to pick the winners. A Veritable Stream of Profits: Sales growth for bottled water may be slowing in some retail channels, but not in c-stores. Reshuffling the Deck: Diets, flavors are stealing share from full-calorie carbonated beverages.